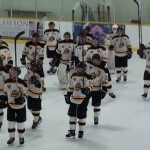 Comments Off on Bruins Lose Close Game in Lakefield! Bruins Lose Close Game in Lakefield! Matt Pollard scored his first junior c goal tonight in Lakefield, but the Bruins fell 4-3 to the Chiefs in a tight hockey match. Matt Allen and Jarett Smith got the other Bruins goals with Max Tjin taking the loss in net. The Bruins opened up a 4-0 lead in Little Britain tonight on the strength of goals by Keegan McCarthy , Jarett Smith ,Marco Mastrangelo and Tim Bierema. But the Merchants battled back to take a 5-4 lead on the strength of Terry Snoddon’s hattrick and it was Matt Allen‘s late goal that sent it to overtime. However the Merchants ended this one just 1:16 into the extra time handing the Bruins a loss. Cody Northover was between the pipes for the Bruins who did manage 3 of 4 points over the weekend. Comments Off on Back to Back Penalty Shots! Back to Back Penalty Shots! After a scoreless first period Marco Mastrangelo took the team on his shoulders scoring on breakaways just 19 secs apart and it was suddenly 2-0 Bruins. Matt Allen setup both plays with Thomas Sheedy adding an assist on the second goal. Both teams had a rare penalty shot on back to back plays before the Mastrangelo goals. The Merchants Roy McDowell cut the lead in half but again 19 secs later it was Liam Blais adding insurance with the Bruins’ Max Tjin making big saves to keep Little Britain off the score sheet the rest of the night! Comments Off on Bruins Win In Shootout Again! Bruins Win In Shootout Again! Matt Allen gets the shootout winner again as Cody Northover gets the win in goal for a 4-3 win in Georgina. check the boxscore for complete scoring recap. Comments Off on Another Home Shootout Win! 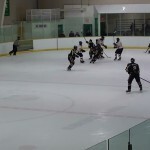 The Uxbridge Bruins let a 5-3 third period lead slip away and found themslevles trailing 6-5 to the Georgina Ice in the dying seconds of the game. However Carter Vahey’s point shot landed in the crease and Marco Mastrangelo pounced on a loose puck to tie it with 6 seconds left on the clock, sending this to OT. End to end action couldn’t find a winner and it was up to Captain Matt Allen in the 4th round on a high glove wrister to get the game winner, while Max Tjin got enough of the Ice’ Curtis Pulhaslski’s shot with his pad to win this one 7-6. check the “Last Game Boxscore” for the rest of the scoring. Comments Off on Mojacks End Bruins Win Streak! Mojacks End Bruins Win Streak! Despite leads of 1-0 and 2-1 on goals by Carter Vahey and Dylan Locke the Bruins ended up on the losing end of a 3-2 score in Port Perry Sunday night. That gives the Mojacks a share of 1st place with the Bruins who have a game in hand and ties the Mayor’s challenge at one game a piece. The losing team’s mayor has to wear the other team’s jersey at a council meeting after the season is over. Max Tjin suffered his first loss of the season. Comments Off on Shootout at the Bear Den! Shootout at the Bear Den! After a scoreless first period the Clarington Eagles Jarrod Hollister beat Cody Northover of the Bruins late in the second for a 1-0 lead. The Bruins came out flying in the third as Captain Matt Allen fed a perfect pass from his blueline to Marco Mastrangelo and his wrister beat the Eagles CJ Sharp, sending this to overtime and then a shootout. After the first two shooters missed, Dylan Locke of the Bruins scored on his chance going high glove side, but Dylan Howorko of the Eagles also scored on his shot. That set the stage for the Bruin’s Liam Blais game winner, also on the glove side of Sharp as Northover saved his final shot for an Uxbridge win, before 285 happy Bruins fans! Comments Off on A Cup of Coffee with Coach Hodgkinson! A Cup of Coffee with Coach Hodgkinson! Click on Link to read the article, courtesy of Roger Varley / Uxbridge Cosmos. Former Uxbridge Bruins forward Will Acton played in his first NHL Hockey game on Oct.1st with the Edmonton Oilers picking up an assist. 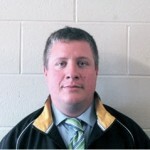 Acton hails from Stouffville and was the Bruins 16 year old in 2003. Congrats Will from the Uxbridge Bruins Executive and we wish continued success in the big leagues! Comments Off on Bruins Win Overtime Thriller! 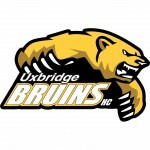 The Uxbridge Bruins played the Port Perry Mojacks on Fri. Oct.4th and came away with a 3-2 thrilling overtime win on Captain Matt Allens rebound shot that went in of off a Mojack defensemens skate, sending the 308 fans home in a happy mood. Allen strip the puck from a Port player at their blueline going in 1 on 3 getting off a back hand shot first before the winner. Shane Smith deflected Carter Vahey’s point shot to tie the game at 1-1 after one and then in the second Allen worked loose a puck by the net and then Vahey’s blast changed direction as Allen got his stick on it to send Uxbridge up 2-1. 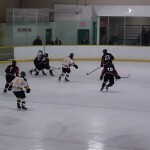 A third period goal by Port sent the game to overtime where Uxbridge won its second game of the season. Cody Northover made several top caliber saves including a glove save on a redirection that had the fans voicing their appreciation. on Sat in Little Britain the Bruins led 1-0 after one on a Jason Simmonds goal, and could’ve been up 2-0 but Marco Mastrangelo was stopped by the Merchants Garret Haden on a penalty shot. they would however add add goals by Allen,Tim Bierema and Shane Smith protecting a 4-0 win for goalie Max Tjin’s first junior C shutout.